Tioga County Historical Society in Owego, NY. Early mourning jewelry such as rings and pendants with skeletons or skull and crossbones reflects Memento Mori or As I Am So Shall You Be. The earliest depictions of these items are thought to go back to the late Middle Ages during the virulent plague known as The Black Death. This plague was a catastrophic pandemic that swept Europe beginning in 1347 and killing millions of people. It is thought to have inspired images reminding the viewer that death comes to all regardless of their station in life. The earliest known version of such images is found on frescoes that date to 1424 in the Church of the Holy Innocents in Paris. With Charles I, Memento Mori started to fade. Some of his supporters began wearing his portrait with a cover for fear of causing political unrest. 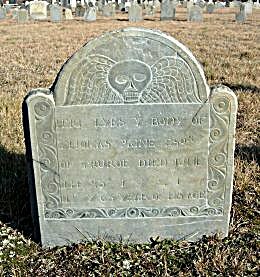 Early colonial gravestones, particularly in Puritan New England, often had the skull and crossbones images. Also, there were gravestones with a variety of epitaphs reminding the viewer that he/she will also die. The changing iconography on the gravestones over the centuries indicates the change in the perception of death and after life. Skull and crossbones changed to images of skulls with wings that symbolized the soul. Beginning in the later part of the 18th century, depictions of angels as comforting messengers sent by God were used. During the Georgian Era the classical dress and urns were items added to mourning jewelry. 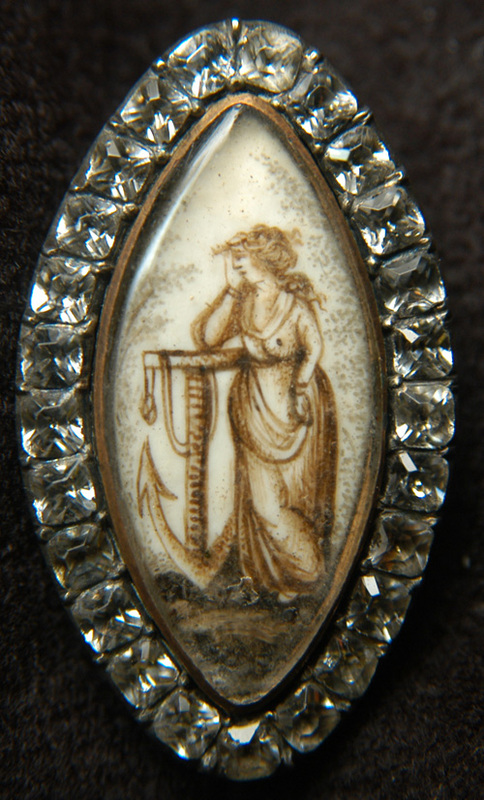 Many mourning jewelry pieces were made from masticated hair (chopped hair and sepia paint). They were a navette shape depicting weeping women pointing toward heaven, holding an anchor (hope) accompanied by a dog (fidelity) often seated at a tomb. The aristocrats were able to commission extravagant pieces of jewelry or mementos. 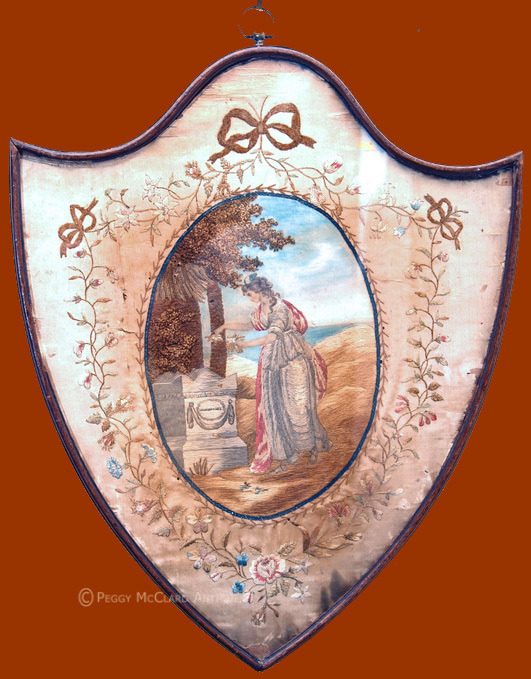 The navette shape was preferred by many with guilloche enamel often used in transparent colors for borders. Rose cut diamonds, pearls and hair were used to depict urns in this extremely high quality jewelry. Allegorical figure of "Hope" in navette-shaped brooch. Above pendant is from the Georgian Era but is not navette-shaped. 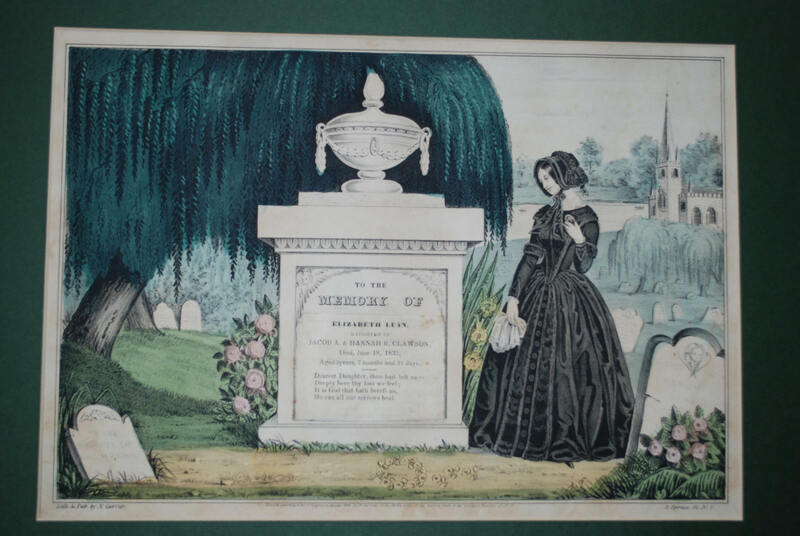 George Washington’s death encouraged more traditional mourning customs in America. Jewelry with portraits such as he specified in his will became the trend. Finishing schools for young ladies helped create watercolors or silk embroideries depicting classical urns and tombs. Artwork and needlework created a way to express the loss of a loved one and would embellish the home. 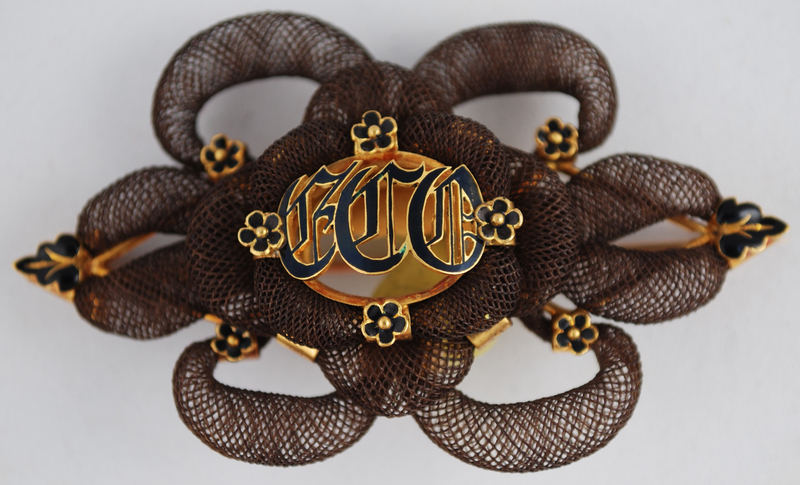 The Industrial Revolution, during the Victorian Era, made mourning jewelry available for both rich and poor. Machine made materials from stamped brass, French jet (glass), bog oak and gutta percha were used to make the jewelry. Extraordinary one-of-a-kind pieces for the rich would have precious stones, diamonds and/or seed pearls set on a black background of jet or onyx. Hair jewelry is jewelry made of hair or embellished with hair. It was worn as memorial pieces in the 17th century. 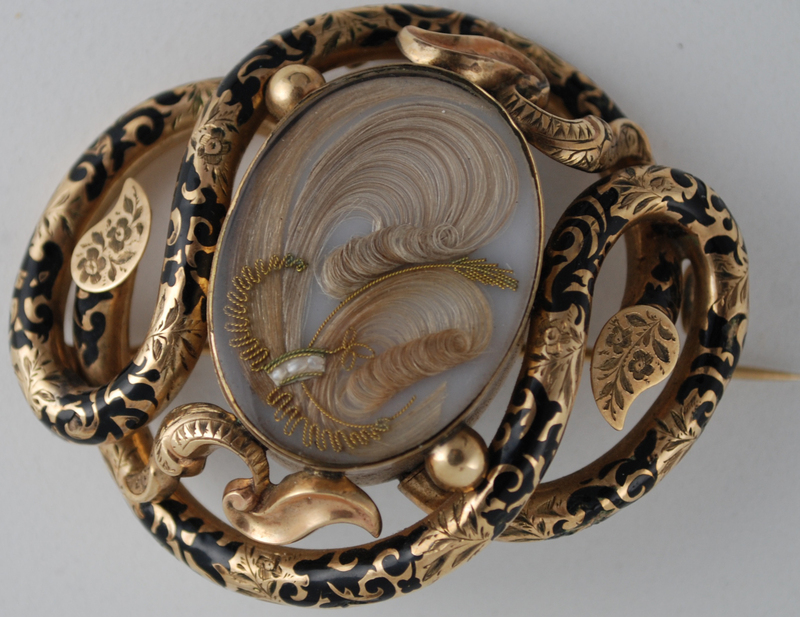 During the later half of the 18th century, hair jewelry became fashionable. Jewelry made of hair was available from professional jewelers or could be made by amateurs. Hair was made into a variety of designs or woven into bracelets and watch chains. During the mid-19th century, earrings, crosses, rings and necklaces were popular types of hair jewelry. 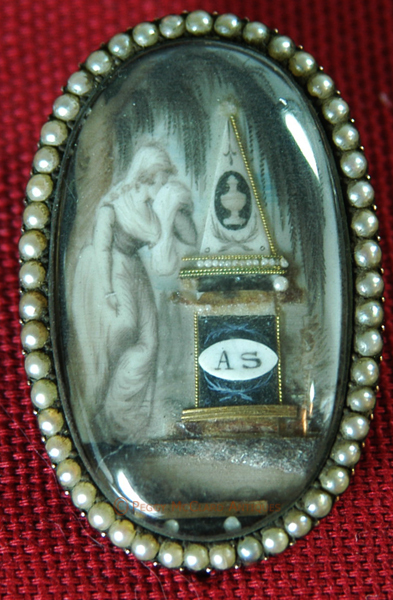 Often, mourning pieces were made using the hair of the deceased. This was a tangible personal remembrance of the dead. Sometimes people left instructions in their wills to have jewelry made from their hair. 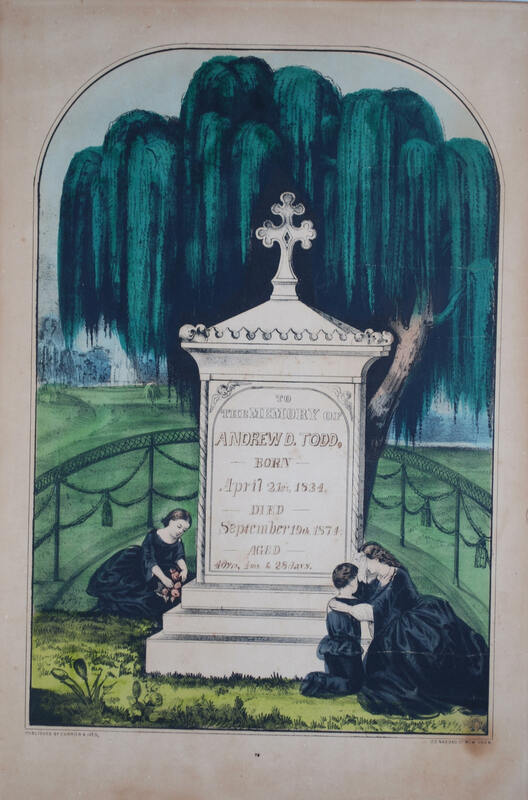 Lithographs were available to the masses depicting tombstones for inscribing the deceased name and date. These were filled in by the family and made a sad, yet colorful remembrance to hang in the home. Postmortem photographs replaced expensive artwork. With cameras available, the middle class would have photographs of family members. Often, the only photograph of a child would have been taken postmortem. The First World War and the influenza pandemic in 1918 altered mourning customs. Women had to work outside the home, therefore, the custom to stay at home in seclusion, dressed in black crepe for over a year was no longer possible to do. In England, the wearing of black was discouraged because they did not want service men depressed when home on leave from the war. Funerals moved to funeral parlors and were no longer held in the home. This change brought about the beginning of living rooms in homes and no longer was there a front and back parlor.